I am one of those people who thoroughly enjoys being organized. But even more, I love finding new ways to declutter and simplify everyday tasks. After all, these days I just don't have the time to fuss with messy spaces. After seeing my Mom's pantry recently, once I got over being jealous that she thought of it first, I decided to be productive and "borrow" her idea. She so cleverly used her canning jars to hold everyday items such as nuts, dried fruit and grains. It turned out so cute I just had to get some for myself! 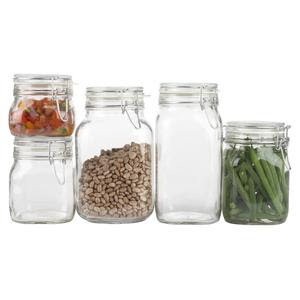 So after doing the routine purge of old items, I purchased a bunch of these canisters (also pictured below) in various sizes and some 1/2 quart Mason jars and completely reorganized my pantry! I am amazed at how easily accessible everything is now. Especially the grains that I purchase in bulk at Whole Foods that inevitably end up stacked on top of one another to a point I don't even remember what I have! Now I can easily see exactly what I have, plus it's so much more pleasing to the eye! The picture above gives an idea of the finished product, though ours is enclosed. 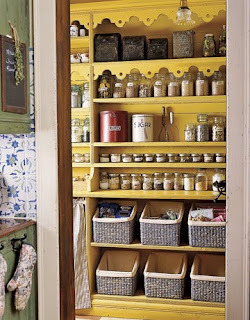 And on a side note, wouldn't you love to open your pantry and see that yummy shade of yellow staring back at you? Definitely on my list of to-do's when we move! oh man..being organized is one of my favorite things EVER!